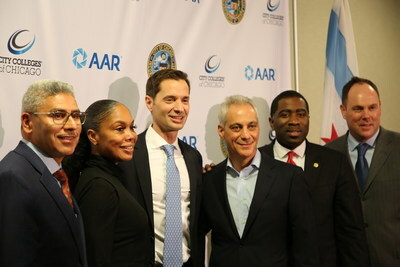 CHICAGO, Dec. 13, 2018 /PRNewswire/ -- Mayor Rahm Emanuel joined City Colleges of Chicago and AAR (NYSE: AIR) to announce the new Aviation Futures Training Center to train students in aviation sheet metalworking. AAR, a global leader in aviation aftermarket services, will partner with Olive-Harvey College to prepare students for in-demand jobs in aviation, heavy manufacturing, boating, automotive repair, and HVAC. "When you bring together the strengths of AAR and Olive-Harvey College, one plus one is much greater than two," said Mayor Emanuel. "The Aviation Futures Training Center will prepare students with the high-quality education necessary to seize in-demand careers in aviation." The Center will launch in March 2019 as an extension of Olive-Harvey College's Transportation, Distribution and Logistics (TDL) Center. The aviation sheet metalworking course prepares graduates for the CertTEC Certification with 300 hours of instruction and hands-on training with sheet metal from airplane fuselages. "This joint effort highlights opportunities for Chicagoans to access rewarding, middle-income STEM careers that are relatively unknown to the public but are in high demand," said City Colleges Chancellor Juan Salgado. "We are grateful to AAR for their commitment to the Aviation Futures Training Center and helping ensure that City Colleges offers programs relevant to the demands of today's workforce." "The shortage of middle skills workers in aviation and manufacturing is at acute levels in deindustrialized cities in the Midwest, like Chicago," said John Holmes, AAR President and Chief Executive Officer. "AAR is actively working with colleges to recruit and upskill workers to get them in the pipeline faster to address the short supply. We're thrilled to be working with City Colleges' Chancellor Juan Salgado and his team, and Mayor Emanuel's Office to drive solutions." The program is part of AAR's EAGLE Career Pathway program, which AAR is introducing at schools near its five U.S. aircraft repair stations. EAGLE demonstrates how students can earn portable, stackable skills and earn $80,000 or more annually within three to five years. The stackable skills will enable students who are interested to pursue the coveted position of FAA-certified airframe and powerplant (A&P) mechanic. There is a shortage of 189,000 aircraft mechanics in North America, according to a study by Boeing.